One of my biggest interests in painting is exploring the effects of light. This is especially effective in the medium of watercolor. 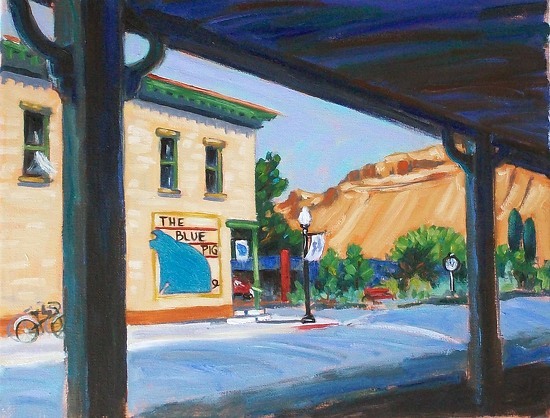 The Blue Pig in Palisade, Colorado is situated in the heart of wine and fruit country. Several festivals have arisen, based on its agricultural roots, including the Honey Bee, Lavender, Wine, and Peach festivals. To celebrate the vibrant agricultural environment, I have focused my collages for the Blue Pig along themes of plants and gardens. Collages are created from my original artwork, embellished with a variety of found objects, and mounted on board. The collages come in two formats: three 3″ square vertical triptychs and the larger 8″ patterned square.